incredibly fed blog: What Baloo didn't tell Mowgli..! What Baloo didn't tell Mowgli..! Try to use the claw..."
Although Rudyard Kipling's story is set in the lush Indian jungle Baloo's survival tips to Mowgli may indeed prove useful should you ever find yourself stranded and alone in inhospitable terrain. 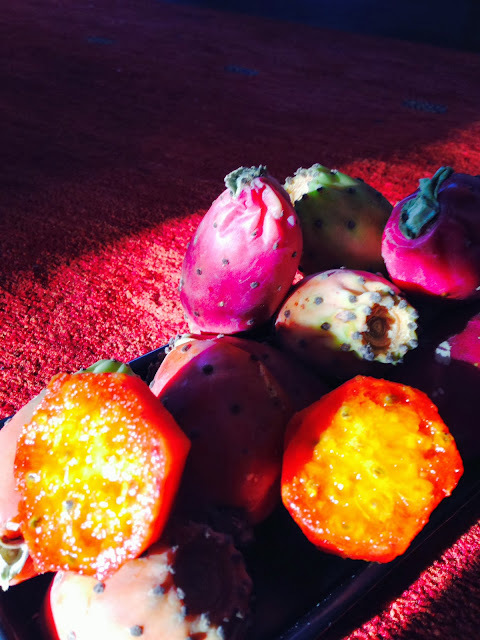 Prickly pears are the fruits of the paddle cactus and grow in very arid locations mainly in the Americas and particularly in Mexico where they are known as 'Nopales'. Beware though if you are tempted to try to harvest them. As Baloo cautions they are covered in nasty spines but even more treacherous are the tiny almost invisible hairs which cover the fruit and the pads which need to be burned or rubbed off. Thankfully when buying them in the market these hazards have already been removed. We saw them recently in our local market and decided to try them out. Having eaten some raw we came to the conclusion that the best use was to make a compote similar to that made with passion fruit. It works well with vanilla ice cream or cheese cake or as a smoothie with bananas. Here we suggest an entirely diferent option though and team them up with chicken livers. Melt the butter and oil in a non-stick pan and add the onion, lardons and garlic . 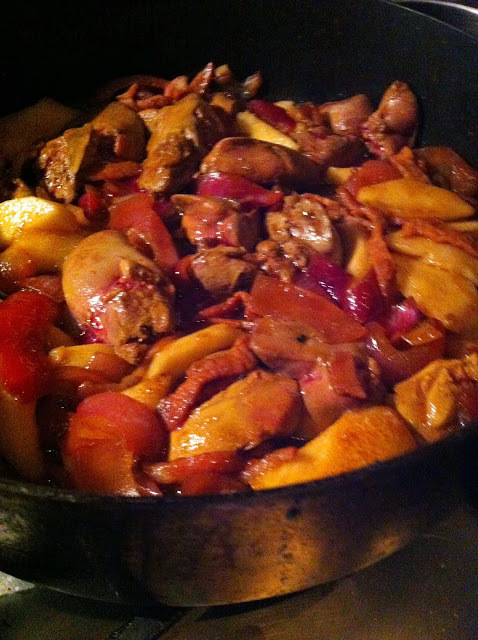 Gently cook until the onion becomes translucent then add the pear slices, vinegar, cayenne, sugar and Worcestershire allow the liquid to reduce and add the livers. Cook gently until the livers change colour - no more than a minute. Finally add the fruit compote. Turn off the heat and season to taste. Serve with mixed leaves or pasta shells. * You can substitute with 1 tbsp blackcurrant jam.